A total of 62 foreigners have been arrested during simultaneous operations in Istanbul on Friday for their alleged links to Daesh terrorist groups, a police official said. 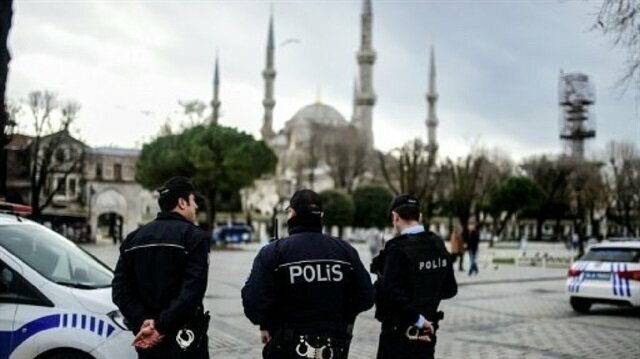 Police carried out the operations in eight districts after receiving a tip that the suspects were plotting a terrorist attack, the official, who asked not to be named due to restrictions on talking to the media, told Anadolu Agency. The security forces have also seized documents and digital materials during the operations. Separately, police arrested one Daesh-linked suspect in another operation in central Kirsehir province. More than 300 people have lost their lives in Daesh-claimed brutal attacks in Turkey, where the terror organization has targeted civilians in suicide bomb, rocket and gun attacks. Turkish security officers detained suspected 634 Daesh members across the country in November.According to information gathered by Anadolu Agency, among the detainees were foreigners and senior members of the group. Of them, 91 have been remanded in custody awaiting trial.The security forces have also foiled many suicide attacks planned by the terrorists, and arms and ammunitions were also seized during the operations.Turkish forces kill over 350 PKK terrorists in NovemberPolice, gendarmerie forces and border troops conducted detentions in various cities including Istanbul, Ankara, Samsun, Canakkale, Hatay, Diyarbakir, Gaziantep, Adana, Aydin, Sakarya and Kayseri.More than 300 people have lost their lives in Daesh-claimed brutal attacks in Turkey, where the terror organization has targeted civilians in suicide bomb, rocket and gun attacks.Turkish security forces have been involved in a long-running campaign to thwart Daesh attacks. Turkish security forces killed over 350 PKK terrorists in a series of counter-terrorism operations across Turkey and northern Iraq in November.According to information gathered by Anadolu Agency, operations were conducted in southeastern and eastern provinces of Sirnak, Hakkari, Diyarbakir, Tunceli, Agri, and Iraq’s northern region.The PKK -- listed as a terrorist organization by Turkey, the U.S. and EU -- resumed its armed campaign against Turkey in July 2015. Since then, it has been responsible for the deaths of more than 1,200 Turkish security personnel and civilians.On Monday, Turkish forces conducted airstrikes in northern Iraq’s Asos region near the mountainous border with Turkey, killing 80 terrorists.End of PKK activity in Turkey 'near', premier saysA total of 296 PKK terrorists were also arrested in the operations. One of the arrested terrorists was a district head for opposition Peoples' Democratic Party (HDP).Additionally, a total of 14 security personnel were martyred, while 15 security personnel and two civilians wounded in separate terror attacks in November.On Nov. 2, six soldiers and two security guards were martyred, while two others were injured in an attack in Semdinli district of eastern Hakkari province.On Nov.3, a police officer was martyred and 9 others were wounded in southeastern Diyarbakir province.Security forces remand 62 Daesh suspects in IstanbulOn Nov.7, a lieutenant was martyred after being fired upon during a counterterrorism operation in the country’s eastern Van province.On Nov. 15, a soldier was martyred in clashes with a group of terrorists in Eleskirt district of eastern Agri province.On Nov.16, two soldiers were martyred and another soldier was wounded during a clash with PKK terrorists in northern Iraq’s Avasin-Basyan region.